Description This Divya Desam is one of the Sethu Stalams, on the coast of Tamilnadu, linked with the Ramayana. It is also known as Darbhasayanam. It is located at Tiruppullaani, near Ramanathapuram. The ancient Tamil Sangam work Akanaanooru has referred to Tiruppullaani. Deities: The Moolavar here is Kalyana Jagannathan or Aadi Jagannathan in a standing posture facing east; Chakravarti Tirumagan in a reclining posture facing east . 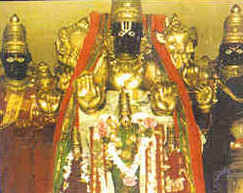 (Kadaladaitta Perumaal) and Taayaars here are Padmasini and Kalyanavalli. There are two shrines here one enshrining Rama in the Darbasayana pose, signifying his resting here and invoking Varuna for help in crossing the ocean, enroute to Sri Lanka in search of Sita. Legends: Rama is said to have blessed Kanva Rishi with a divine bow. Aadi Sethu, the bathing ghats on the ocean - is located at a distance of 2 km from here. Devipatnam nearby houses the Nava Pashana shrines, representing the Nava Grahams, said to have been installed by Rama. Belief has it that barren women beget progeny upon worshipping at Devipatnam and Tiruppullani and residing here. The name Pullaani arises from the legend that Vishnu appeared here under the Aswatha tree, in response to prayers by Pulla Maharishi, hence the name Pullaranyam. This shrine is also said to be associated with Vibhishana Saranaagati (Vibhishana's surrender). The Pattabhi Rama shrine is said to represent Rama's pointing out to Sita, the spot where he had rested earlier (while he returned to Ayodhya with her). The temple: This temple with two prakarams covers an area of about 1.5 acres and is crowned with a 120 feet high gopuram. The Ramanathapuram Royal family has patronized the temple. Festivals: Four worship services are carried out here. The annual festivals are celebrated in the months of Pankuni (for Aadi Jagannatha Perumaal) and Chittirai (for Pattabhi Rama) and the Adhyayanotsavam in Margazhi.